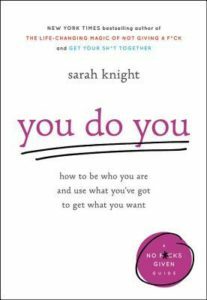 You Do You by Sarah Knight is an unabashed self help book of sorts in which the author illustrates how to have more self confidence and life a more fulfilling life. The book’s approach is a bit unorthodox, leveraging profanity and a unique candor that capture your attention and make you think twice about your perspectives. Knight drives readers to identify what truly makes them tick and to be proud of what makes them different or authentic. There’s room for self-reflection and discovery in between her relatable stories (who hasn’t cried at their desk or felt like the odd one out?). Central to Knight’s theme is the allowance that some of us (or many of us) feel different or don’t fit in. And we try to assimilate to avoid confrontation or humiliation, and in the process we sacrifice who we truly are. She notes that she became tired of feeling that she needed to be the one to change, or that something was wrong with her because she is different. To be different is okay. Most important is to spend the time figuring out what you truly like and who you truly are, to make sure you are selfish (in a healthy way) and to tune out the haters. If you are firm in what you want, need, and deserve, then you can stand up for yourself to people who question your decisions, tell you that you will have regrets, and pass judgment after judgment on you. When you like what you like and do what you want to do, you may not always find yourself in the majority. And being different can be interpreted by others as being difficult instead. Knight makes it clear that it is okay to be difficult when you are being true to you. Be yourself, and if others think that your preferences are a hassle, that’s their problem and not yours. She underscores that “there is nothing wrong with liking things the way you like them and asking for what you want”. And taking it a step further, she challenges us to explore that there is nothing wrong with us. Not gaining social acceptance or meeting “the norm” doesn’t mean there is something wrong; it means we are strong unique people who know what we like and who we are. You Do You is Knight’s third self-help book, coming after the titles The Life-Changing Magic of not Giving a F*ck and Get Your Sh*T Together. Knight does not hold back in the potty mouth department, and while some may find this gimmicky, I actually found it refreshing. Knight writes with an authentic tone that makes her more relatable and more believable. It’s much easier to identify with someone who talks like many of us or our friends do. Quips like “You might die tomorrow. Take a risk today.” and my personal favorite line “I am sick and f*cking tired of people who don’t understand me telling me that I’m the one who’s difficult” had me shaking my head in agreement. Here is someone who has been there, who has gone through similar to things to me, and who gets it. More formal self help books seem to be talking at the reader. Knight is talking with her reader. She gets it, and she wants you to get it. And she airs out her own experiences so you can relate even more. This is a refreshing read for those who have picked up one or more self help books in the past but found them less than stimulating. If you tend to shy away from strong language, then this is likely not a book for you. Self help books are no replacement for personal introspection or medical or psychological therapies. But Knight’s way of speaking right to her reader and calling them out on what doesn’t work for them makes this a worthwhile but rather quick read. A rather solid piece of non-fiction, self-help writing, but I reserve my 5-star hand outs for a select works that impact me a little more deeply.